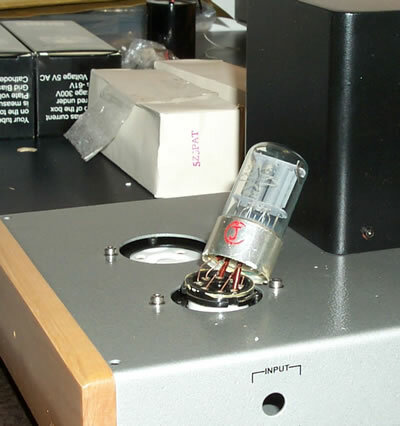 After looking for several options I decided to buy "The Billie" an kit from DIY HIFI supply. Click here to see other kits. 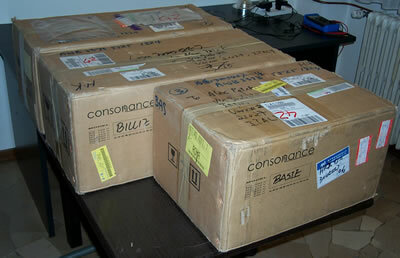 The monoblocks where sent from Hong Kong by Fedex on wednesday Feb. 5, 2003 and arrived in Italy on Friday Feb. 7, 2003. Each monoblock was packaged separately. The smaller pack is the Pre-Amplifier Kit - The Basie. Two of the tubes didn't survive the transport. 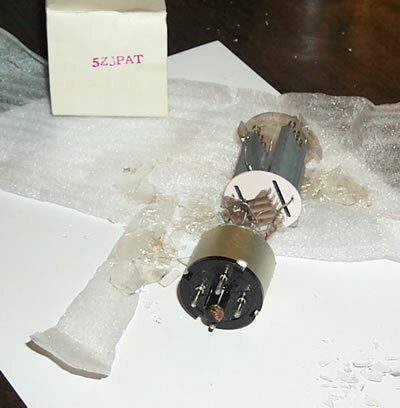 The rectifier tube 5ZJPAT and the driver 6N9P(6SL7GT) where broken. Brian will send out some replacement tubes. The driver tubes where in their sockets. That's, the reason why one tube was broken. Also the driver tube from the other monoblock was "twisted" but didn't break.